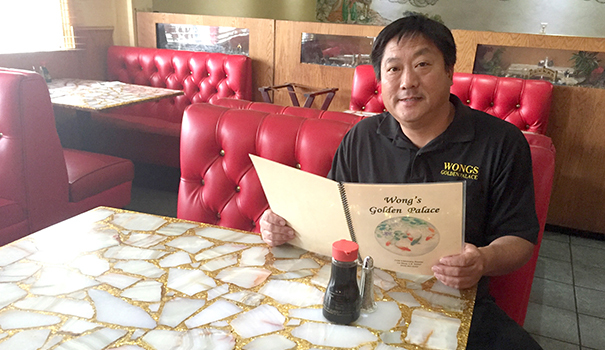 Jeff Wong remembers playing with his siblings in a back room of Wong’s Golden Palace while his parents swooned customers with dishes like orange chicken, walnut shrimp and Mandarin fried rice. “My dad cooked and my mother worked the front of the house. They didn’t want us disrupting anyone,” he recalled. That was back in 1966, when Wong’s first opened and non-Asians viewed the fare as novel and exotic. 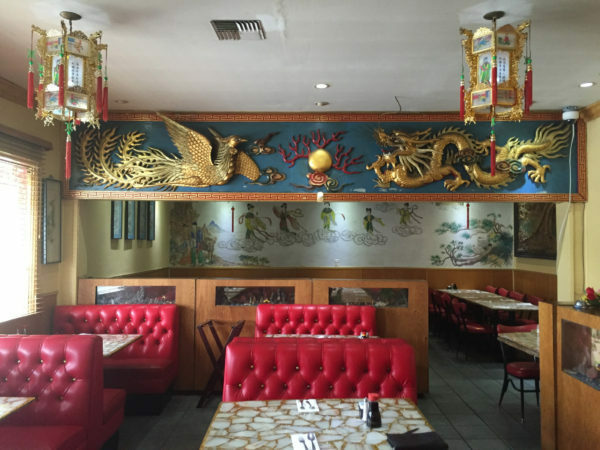 The restaurant’s décor also sent patrons to a distant land via imported Chinese lanterns and elaborate wall plaques flaunting hand-carved images of dragons and ancient Chinese port scenes. None of that has changed. Wong’s parents, Stanley and Helen, opened the decorative “palace” at 7126 University Ave. after moving here from San Francisco. They had emigrated from southern China with the vision of launching a place to showcase their cuisine and culture. But the Bay Area was saturated with Asian kitchens, so they set their sights on La Mesa. Now in retirement, the couple passed the torch to Jeff Wong, who was tasked with replacing the restaurant’s plumbing and electrical systems after a kitchen fire broke out in August 2017. The damage was confined to the stove and hood areas, but the upgrades required by the city and health department amounted to $200,000. 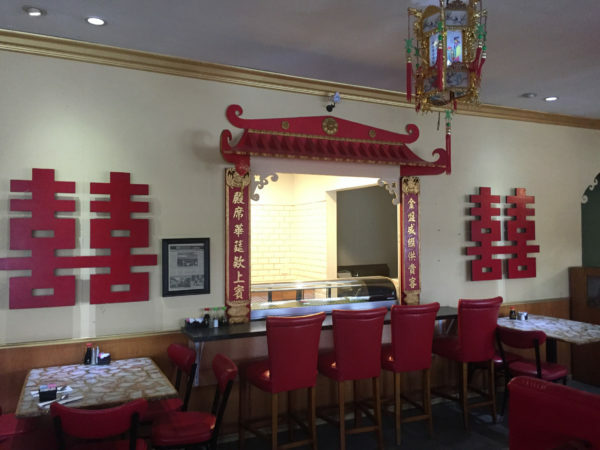 Wong’s Golden Palace reopened in early May. Its adjoining bar, The Dragon Room, sprung back to life a few months earlier. Wong’s parents acquired the bar lounge several years after opening the restaurant. They knocked down a wall to create an interior passageway connecting the two. “It used to be a Hell’s Angels bar before my parents took over,” said Wong. The Dragon Room opens daily at 6 a.m. and features karaoke four nights a week as well as live classic rock on Saturday nights. Sitting between the bar and restaurant is a small open-air smoking section with the restaurant’s original koi pond. Wong pointed out that several of the larger koi are more than 40 years old. Numerous other historical elements prevail throughout the establishment, which at this point in time stands as a museum to Chinese restaurants of yesteryear. 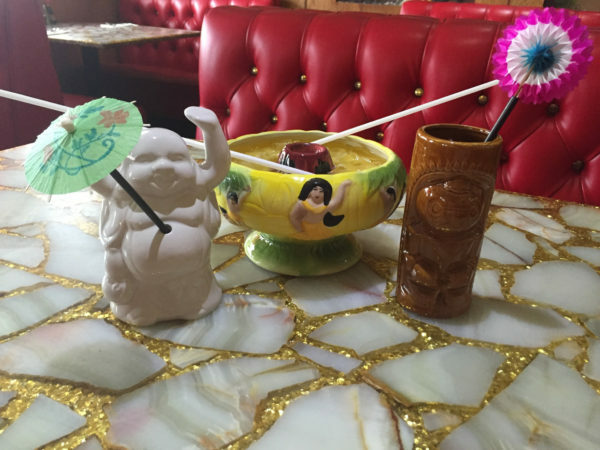 Cocktails, for example, are served in a variety of kitschy, ceramic vessels ranging from Buddhas and angels to tiki barrels and moat-shaped bowls. The latter are designated for fruity rum-spiked flaming scorpions, which come with 18-inch straws for easy communal sipping. Po po platters containing assorted appetizers are still served on old boards with mini habachi grills in the middle. Fueled by Sterno, they’re used for adding a barbecue essence to some of the already cooked meats you get. The décor is equally precious — all of it imported from China by Wong’s parents. Miniature landscapes are displayed in glass cases throughout the dining room while two wall hangings of significant size reveal intricate relief work in wood and bronze. In the Western world, they might qualify as godly art suited for old churches. Most unusual are the dining tables residing between the red leather booths. Wong doesn’t know where his parents obtained them, but their irregular-shaped pieces of embedded marble, separated by gold inlay, possess a strange gaudiness unrelated to any particular culture. From a culinary standpoint, Wong says nearly the entire menu is exactly the same as it was more than 50 years ago. Dishes that became his favorite as a young child haven’t changed: chow mein, fried rice, sweet and sour pork, and “Wong’s special noodles” in a dark sauce with vegetables. “Just about everything is made from scratch, including the egg rolls and pot stickers. And we still cut our meats and fish in-house,” he said. Coming in June are various sushi rolls, which will mark the first additions to the menu in many years. Wong recently installed a small sushi counter, which signaled one of the first changes to the dining room in decades. The introduction of sushi, he added, is an attempt to procure new customers seeking something modernly familiar. In the meantime, longtime patrons have begun returning to both the restaurant and bar with giddy excitement, per the full parking lot on a recent weekday morning and the enthusiastic patrons inside. As for the notion of giving the space a more modern look down the road, he doesn’t think so. “My folks are adamant about keeping the facade and the art the same. I can’t see them ever being replaced,” he continued. The website for Wong’s is currently being rebuilt. Until then, call 619-465-9222 or 619-464-9772 for more information.